San Luis Obispo, CA. Although some might say we're in the middle of no where, I've never seen such a live and healthy electronic dance scene! Over the past year, we've attracted big names like Benny Benassi, Steve Aoki, and JFK (from MSTRKRFT), along with endless local talent, melting faces nearly every weekend! THIS THURSDAY (Feb. 3), if you couldn't read the giant poster at the top of this post, two of SoCal's hottest acts, LA Riots and Peace Treaty shall be bringing down the electro-hammer all night long! 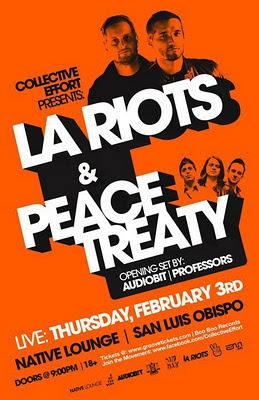 And like I said earlier, SLO is chock-full of local talent, so be on time because you don't want to miss out on heavy-hitter, Audio Bit and college, party-crew, the Professors, throwing down the opening sets. Get your tickets NOW and be ready to cut some serious rug! Didn't know LA Riots could throw down the dirty dutch-electro? This b33t is a must-harvest! This trio defines dirty-electro. Wild synth-lines, skull-crushing drops, and everything in between, you don't want to miss out on this show! A newer group of DJs that have popped up in SLO, these guys know how to get your blood boiling. Below is their latest "Riot Mix". Its raucous, belligerent, and unholy. Very versatile, it ranges from dirty-electro, house bangers, and wibbly-wobbly dubstep that'll have you eargasming for 50 mins straight (or how ever long the mix is). For you Soundcloud n00bs, to download, click the little down arrow. Like what you hear? Stay updated and follow them on Facebook and Soundcloud!!! I wasn't too familiar with this guy's music so I put on my detective hat and did a little hunting. When I say this guy is a heavy hitter, I mean head-in-the-microwave, staring straight at the sun, sting ray stinger through the heart, Steve Irwin-style (RIP). Not to sure where I was going with those analogies but you get what I'm saying! His producing skills are on point with dubstep looking to be his specialty. I couldn't find any tracks for download but MAKE SURE to check out his Soundcloud and give them a listen. Audiobit - I Need You by AUDIOBIT! Put on your party G-stringz, izza 'bout ta be BUCKWILD! still can't get over how raw the paradise poltergeist remix is.